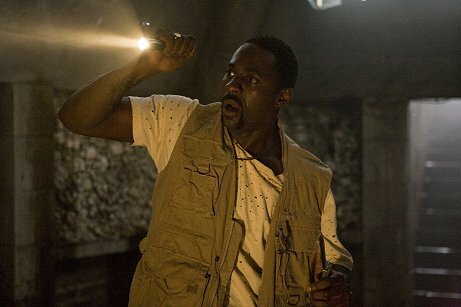 Elba was back on the supporting sidelines for first major studio film role, Stephen Hopkins' long-delayed supernatural horror film, which was actually shot prior to Daddy's Little Girls but had received numerous release delays from Warner Bros. That latter fact turned out to be far from surprising once the film did reach theatres, for it and Elba's role--Ben, sidekick scientist to Hilary Swank's lead--are pretty unremarkable in any qualitative regard. In playing a functional supporting role Elba more than adequately fulfills his duties, but more interesting than any work in the movie itself is how the project did signify a few signposts. First, it was Elba's first theatrical venture into effects-laden genre fare, which he will continue to return to in ways both bigger and smaller; second, he had previously worked with Hopkins on an unsold television pilot, showing how he maintains those healthy working relationships, which leads to the third point--he would later work with Joel Silver's Dark Castle Entertainment again in the future.